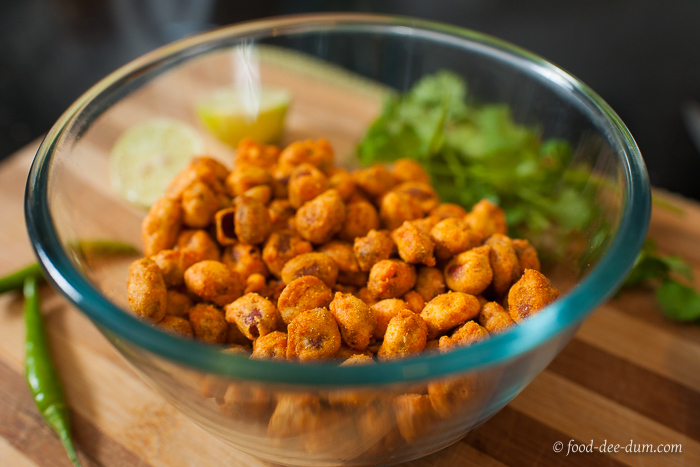 Masala Peanuts are a great favourite “bar snack” or Chakhna in North India. Popularly served in bars, restaurants, community clubs and more, they’re usually the cheapest item on the menu and quite a few steps up from simple salted peanuts. Chakhna is a unique North Indian concept. It refers to salted snacks which are served with alcoholic beverages – at home or in a bar/restaurant. Derived from “chakh“, meaning taste, the word chakhna literally means “to taste”. It’s a verb but has a very specific connotation. A snack could be anything and could be served at any time but chakhna refers only, and only, to those salted snacks accompanying alcohol. It is never sweet. And any other savoury or salted snacks served with non-alcoholic beverages is just namkeen (loosely translated, means salted). The chakhna menu ranges from simple salted peanuts, to papads, fried savoury mixes, french fries or cutlet type of items or even other grilled/fried meats like kebabs, if you want to get fancy. But I’m willing to bet that masala peanuts top the list with regard to preference as well as availability. If you were to visit any of the Defence Officers’ clubs in India, masala peanuts is definitely the most popular snack available and loved by folks of all ages. Essentially, it’s just roasted or lightly fried peanuts with finely chopped onions, green chillies, coriander, some seasoning and a generous squeeze of lemon juice. There. That’s all there is to the recipe. So simple, yet delicious and irresistible. 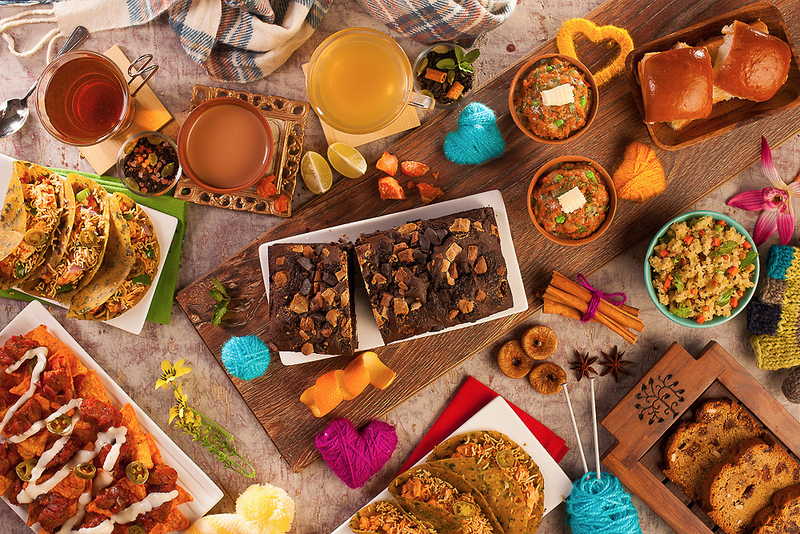 A regular sized serving tends to disappear in a matter of minutes, whether there are 2 or 10 people sharing it. So what do I do that’s so very different? I have a little cheat that adds a whole lot of zing to the simple recipe. 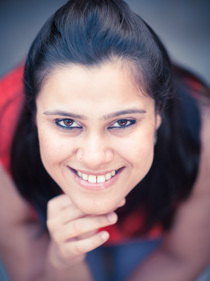 My masi (maternal aunt) told me this little trick and it changed everything! I substitute regular shelled peanuts for coated ones, like Nutcracker or other similar coated peanuts by other brands. These are coated with some sort of chickpea & rice flour mix + spices and deep fried to make a delicious, crunchy snack. These are pretty amazing by themselves, but the chopped masala & lemon juice just takes them to a different level. It sounds like a small and unnecessary substitution but, trust me, it makes all the difference. 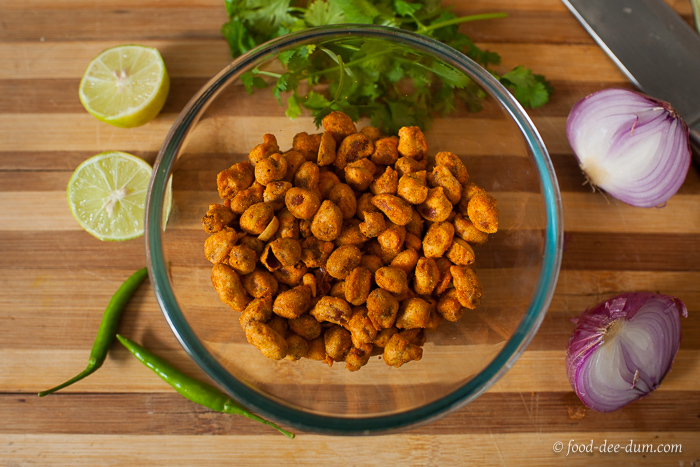 These masala peanuts are equally delicious as a bar snack or as a tea time snack. Got the rest of the ingredients together. Chopped the onions, green chillies and cilantro very finely. Added them to the peanuts in a mixing bowl. Squeezed in the lemon and mixed it up. Told you it was that simple. Don’t just take my word for it. Try it yourself. Seriously. Five minutes is all it takes and you’ll have scrumptious chakhna, a.k.a. 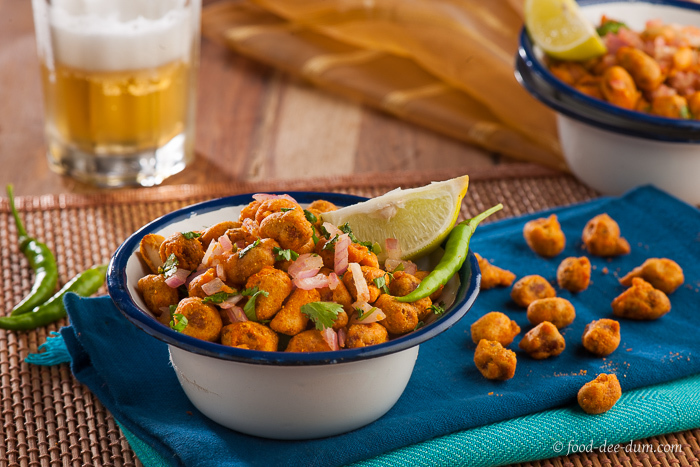 masala peanuts with your beer tonight! 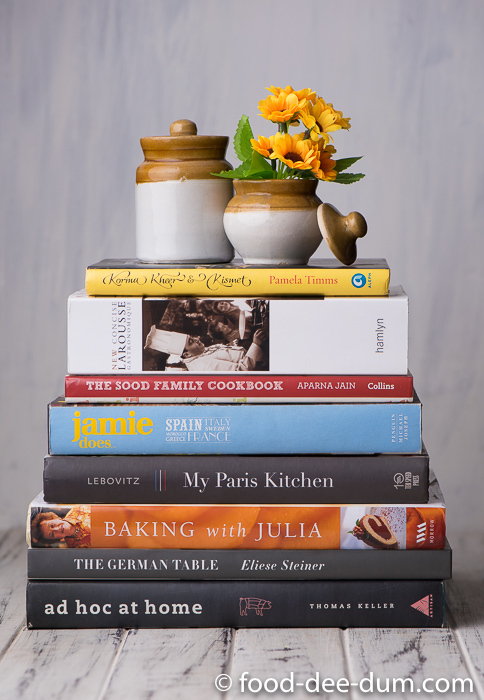 The recipe isn’t really even a recipe and is very versatile – open to interpretation and modification. So go ahead and make these however you like. Change it up and it will still be delicious. I promise. 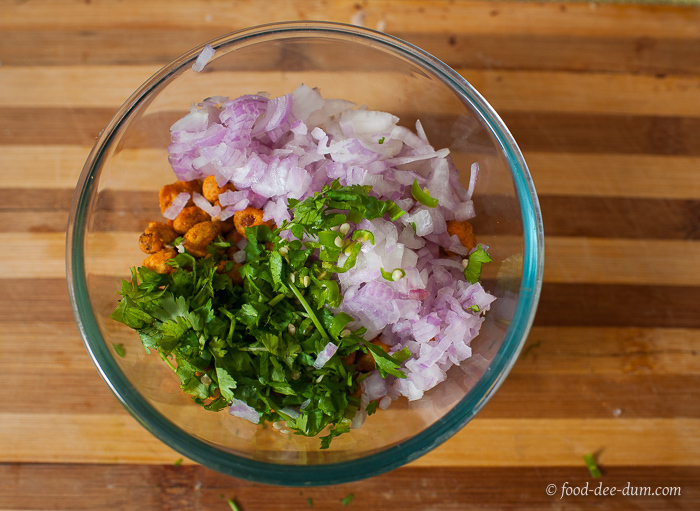 Have a different way of making Masala Peanuts? Leave me a comment to tell me about it! 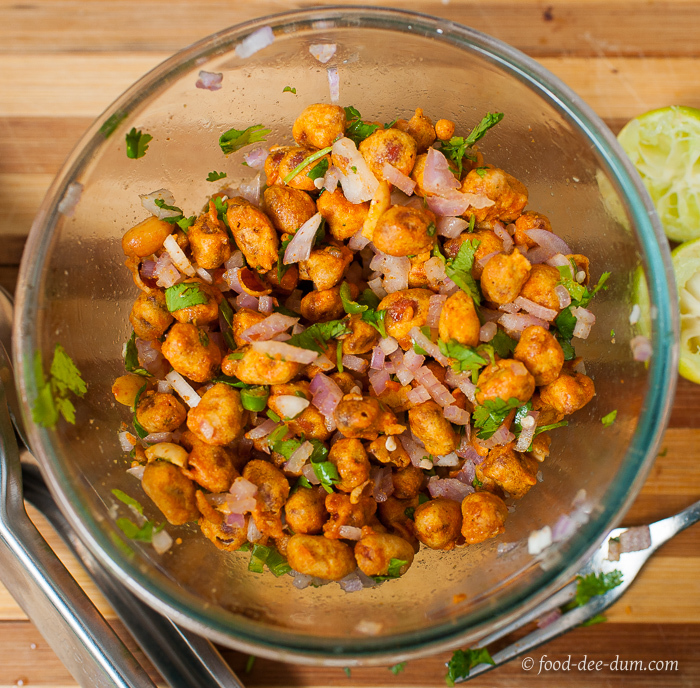 A savoury bar snack, also known as Chakhna in North India, these masala peanuts are quick, easy and delicious. 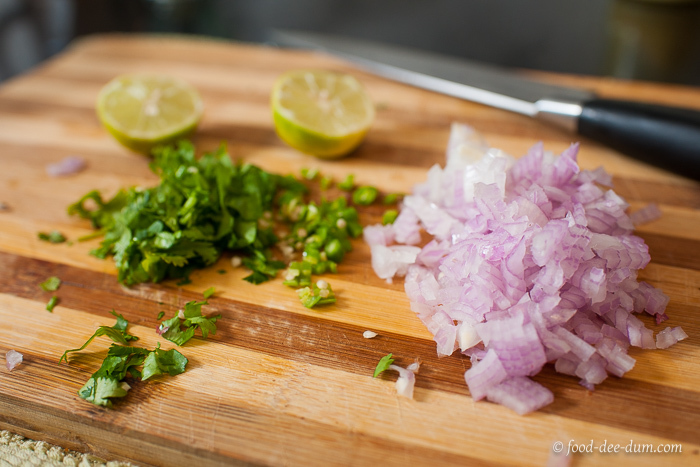 Chop the onion, green chillies & cilantro leaves very finely. In a mixing bowl, measure out the coated peanuts. Add the chopped onions etc. Squeeze the lemon juice, give it a good mix and serve immediately. For a party, you can scale this recipe easily. Chop everything and squeeze lemon juice in advance. 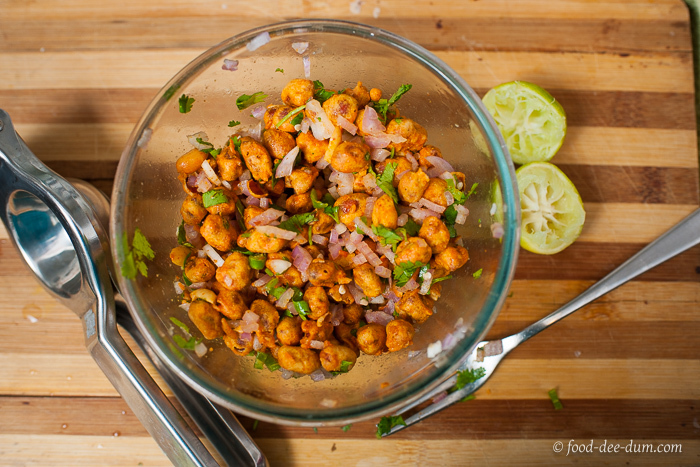 Just keep mixing the peanuts and masala as and when you need them - one serving at a time. « The first professional food photography assignment with a mobile phone!